Better Together » Blog Archive » Happy Halloween! This year we weren’t able to make it out to the pumpkin patch to get our pumpkins. Something about 70 MPH winds and 40 degrees doesn’t scream let’s play outside! So we instead went to our local market and picked up a couple pumpkins, on sale mind you, and headed home. Because of our lack of time and ability to get our pumpkins, we finished carving them just before our Trick or Treating Saturday night. Anna enjoying playing with the goop and Izzy just didn’t know what to think of it. Needless to say she was done quite a bit sooner than Anna. Anna chose a monster for her pumpkin (thank goodness it was a 2 of 5 difficulty rather than mommy’s last years choice of 5 of 5). Gary decided Izzy’s would have their names on it. 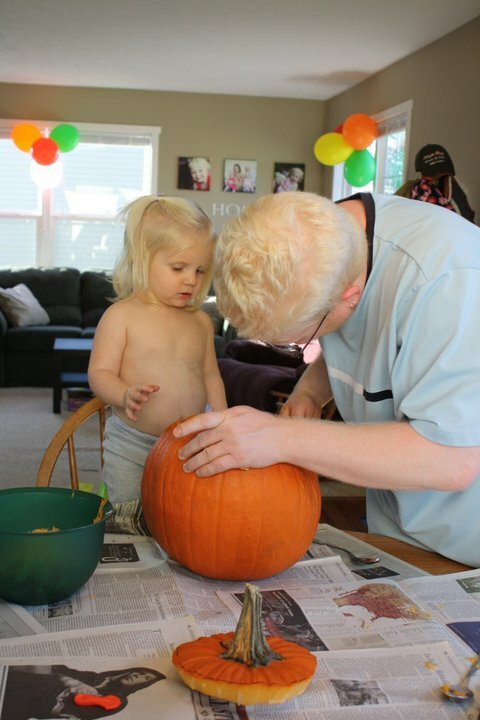 All was going so wonderfully carving our pumpkins…. until I broke the wonderful little, feels cheap but works amazing, pumpkin carver. The harder one was done when it happened and the name carving ended with a serated steak knife and a broken “zz” in Izzy’s name. Nothing that a little toothpick won’t fix! We all ate dinner together, once a month cooking lasagna, which was delicious. 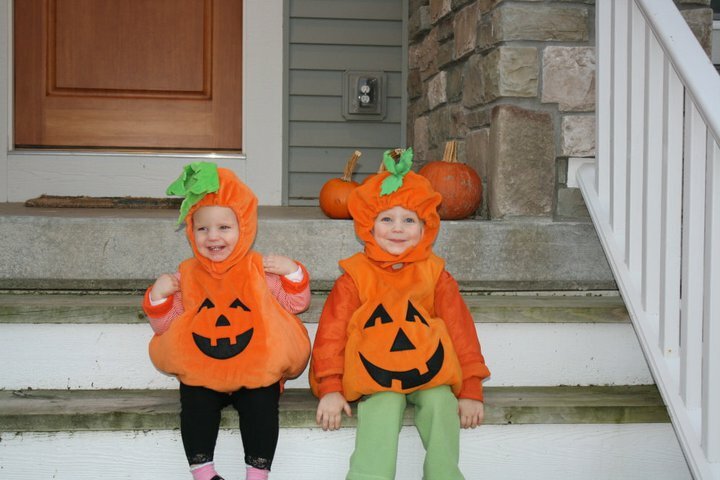 Then as the sun was setting (way to early these days), we dressed the wee ones in their pumpkin costumes. Back up….. So I had been asking Anna what she wanted to be for Halloween. I think this is the first year she’s getting it. So at first, we were a spider. Then we were a ghost. Finally I got her to say pumpkin a few times. Well I had planned on Izzy being the pumpkin as Anna was last year. So the hunt was on for another pumpkin costume. I just so happen to find the same costume, just a size smaller at the thrift store for $6. Good thing Miss Izzy is a bit on the short and squat size that the smaller size fit her perfectly and the little taller skinny mini Anna fit into the costume she wore last year. And it was so. Back to present…. We get them dressed in their orange finery and off we went into fairly decent weather for trick or treating (last year we lasted the neighborhood it was so stinkin’ cold and windy). We hit up some neighbors and headed over to the bigger neighborhood next to us. Ann was her usual “excited to go but won’t say a word” self when we got up to the door. So her little sister took up the slack and said in the cutest little voice “trick o treat” and “happy hawoween!” Not only did she know what to say to get candy, every time we loaded her back up into the wagon, she said “this house” so we’d move along to the next house. Stinker! Well, we made a haul of course! Even need to dump the excess in the wagon to fill up our buckets again! 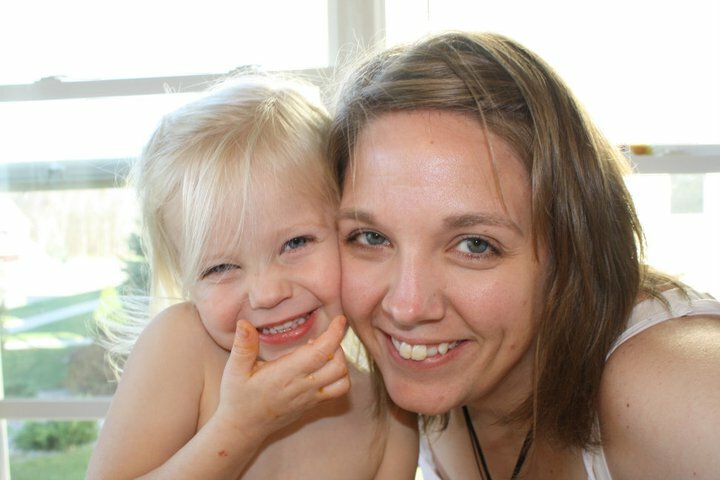 Anna decided which 2 people would accompany her to the door, Grandpa and Daddy, Aunt Sheila and Mommy. Too funny. They had a great time and it just amazes how much Izzy already has caught on to, even earlier than Anna did! Another successful trick or treating night!